OK, we have our parts on order, and our differential housing is back from the machine shop. 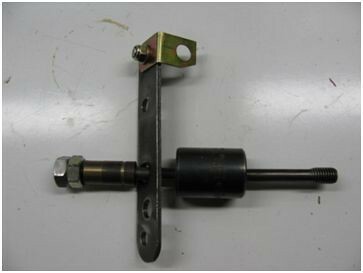 In keeping with our decision to replace the main shaft and pinion shaft bearings, we’ll also replace the differential carrier bearings. 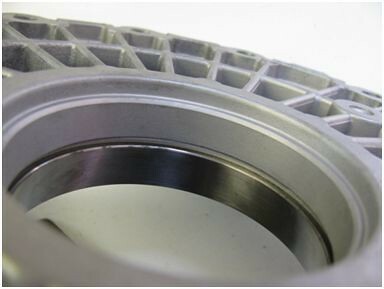 First, there are three manufacturers of the bearings, FAG, SKF and Timken. 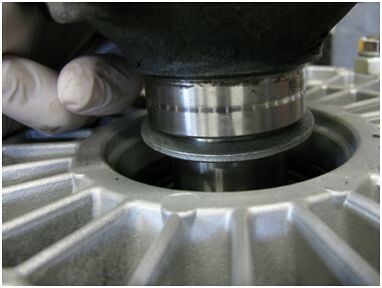 Unlike other bearings inside the 915, carrier bearings require adjustment, which can be achieved with a minimal expense for tools. 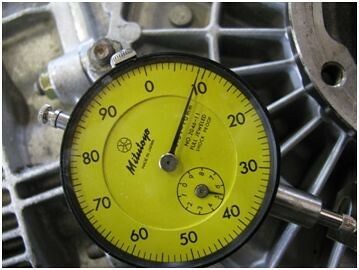 The adjustment is called pre-load; and is measured by the amount of torque required to turn the differential with the side cover on and tight. 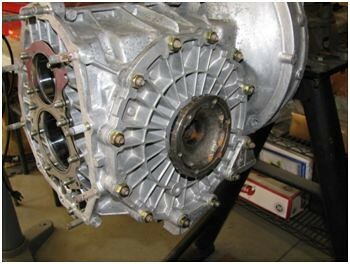 …ugh, to hold that race in the housing, a couple of synchros installed, and back into the car with the description, “rebuilt.” The 915 transmission carries with it the stigma of being bad news. That reputation is both undeserved and unfair, but the sheer number of poor shifting, maybe noisy, 915s out there is mind boggling, thanks to incorrect adjustments, repairs and neglect. Even the wrong transmission oil will affect drivability and durability. The only win-win situation is the result of a correct repair, combined with a correct installation, a correctly adjusted clutch, and correctly maintained shift linkage. … and an inch/pound torque wrench with a range up to 60-70 lb/in. The wrench must not be a click-type unit; it needs either a gauge or a needle pointer. My washer is slightly oversized on the OD, so I had to bevel the outer edge for clearance; I’ll explain this later. 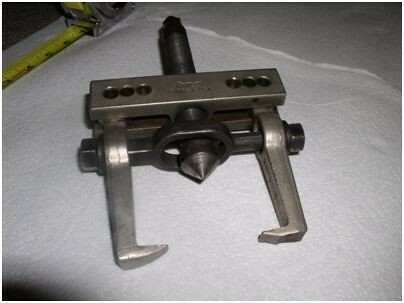 …is available to remove bearings, but a high-quality puller with the correct length jaws will also work. Actually, a puller is necessary on the speedo sensor side (915s equipped with electronic speedometers); the factory tool only works best on diff bearings without an electronic speedo magnet ring. Like my snap-ring pliers, my puller’s jaws have been ground to fit for this particular job. 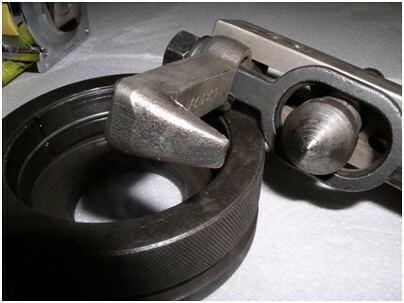 Additional grinding would be necessary for the puller’s jaws to work on bearings that can’t be removed with the factory puller. 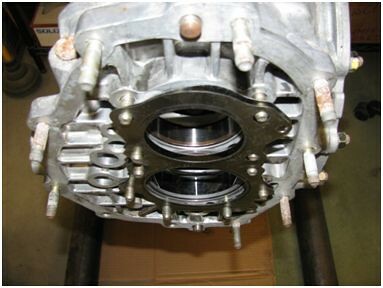 …into the hole, in the center of each carrier bearing, that the axle flange fits into. 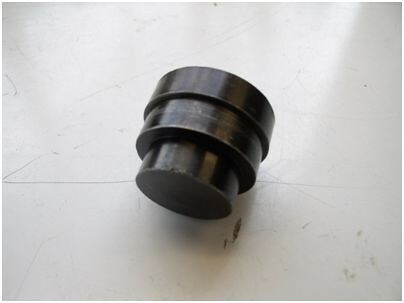 The puck measures 30mm (length) x 37.6mm (diameter) x 34.8mm (1st step) x 31mm (end step). 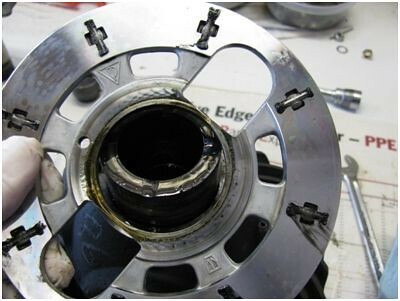 As you remove the bearing on the speedo sensor side be aware that the magnet ring will come off before the shims. 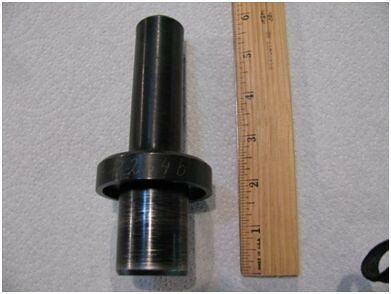 Notice that there are two shims, the thin one is .25mm (for fine adjustments); the thicker one is usually about 2.7mm - 3.1mm (available in 1.0mm increments from 2.4mm to 3.7mm). NOTE: Only do one side at a time, start to finish! 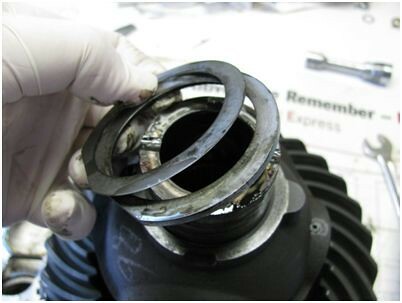 If you do not have the capability to reset the ring & pinion the shims must not be mixed up! After shim removal, clean them, and the surface they contact, thoroughly. When you install the shims note that the thick one (there might not be a thin one) goes on first, and it will be beveled on one side only – that bevel goes toward the diff carrier. 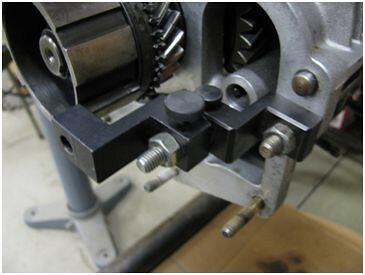 …and use the press to install the bearing. 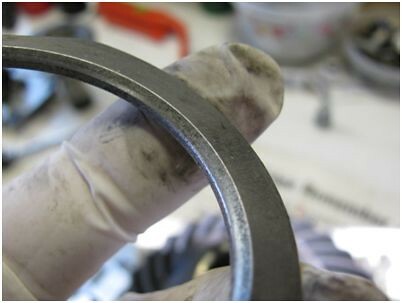 If you’re doing the bearing on the side with the magnet ring, don’t forget to install it after the shims and before the bearing, clean and dry, of course. 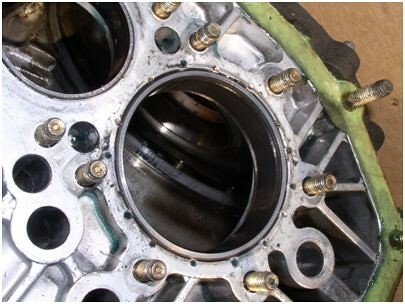 Repeat the procedure for the opposite side, but only after you; (1) install the outer race for the already installed bearing, or (2) you return the race to its box and write either, (a) speedo side, or (b) ring gear side on the box. 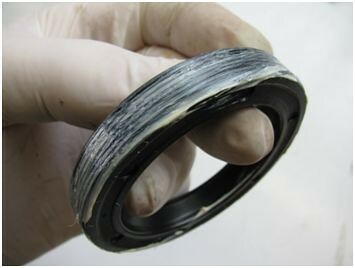 Never use a new bearing race with; (1) an old bearing, or (2) a bearing from a different package. 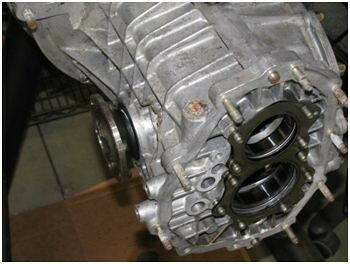 Clean the bearing race openings in the diff housing and the side cover, and install the races. This can be done a variety of ways, and, often, a press is not required because the parts don’t fit that tight. However, if a press is handy, use it! Once both bearing races are installed, insert an axle flange into the ring gear side of the diff carrier, snug the bolt, and use the flange to lower the diff into the housing. 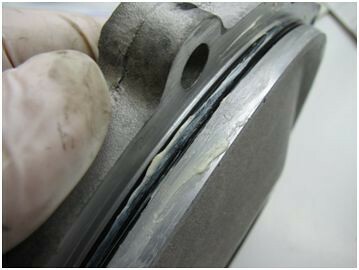 When the lower bearing is seated in its race remove the axle flange. NOTE: Don’t put the cart ahead of the horse at this point. I know that it’s tempting to give the diff a spin; don’t. Its weight is sufficient to push it off center, and if it won’t spin (more likely than not) all that you’ll do is worry about why it’s not spinning. 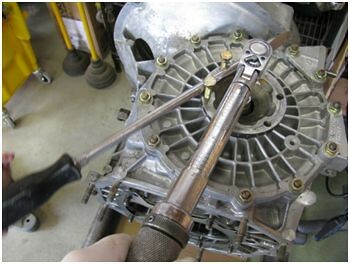 Install the axle flange bolt and hand-tighten it using a socket and ratchet. Install four equally spaced nuts on the side cover, and use them, a little at a time, to “push” the cover into position. As you do this frequently turn the axle flange (with the washer in place the diff will turn with the flange), to be sure that the diff bearings aren’t binding. NOTE: Look at the diff in the above picture. You can see that the bearing stands proud of the carrier. If the special tool washer tightens against the bearing, before it contacts the diff, it won’t lock the diff to the flange. This is the reason that my oversized washer is beveled, so it won’t touch the bearing during tightening. As the cover gets close to being tight against the housing you will feel the axle flange get harder to turn – this is normal. 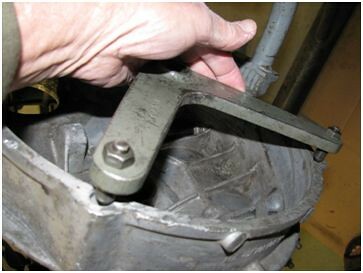 If all four nuts are tight and the diff still turns (STOP immediately at any point if you can no longer turn the flange), install the remainder of the nuts (I use a washer under each to avoid scarring the cover), and torque them, I use 17 lb/ft, in a star pattern working from one side to the other, one nut at a time. 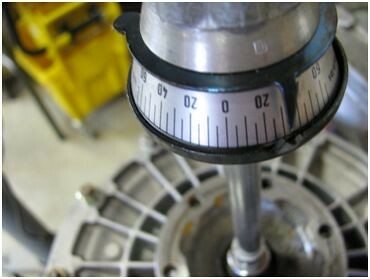 Put your torque wrench in place, with a socket, so that you can use the wrench to turn the axle flange. In the picture the pointer reads approximately 28 lb/in, but initial effort produced a couple readings of 30 lb/in, which is acceptable. 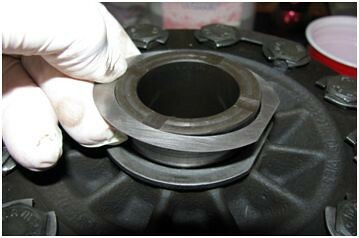 This procedure is strongly recommended even if the decision was made to not replace the carrier bearings. I have found carrier bearing pre-load far enough out of spec that the diff could be turned without registering on the torque wrench. I can’t guess why, but side cover expansion is my best theory because I doubt that Porsche set up differentials outside of their own engineering specs. 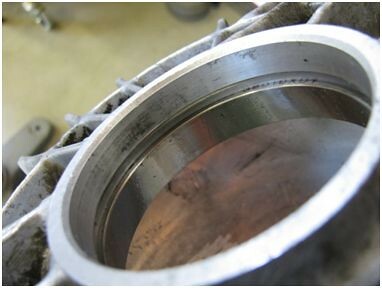 Now, did you install SKF/Timken bearings, or FAG bearings? Believe it or not, the pre-load spec for each is different. The torque range overlaps in the middle, but SKF/Timken bearings (original factory literature does not mention Timken so I err on the low side and set them to the SKF spec) should be 26-36 lb/in, and FAG bearings should measure 30-56 lb/in. Normally, even after bearing replacement, the pre-load will be in spec, but what should be done if it isn’t? What we’re going to do now is take a little side trip, and try to prove a theory. 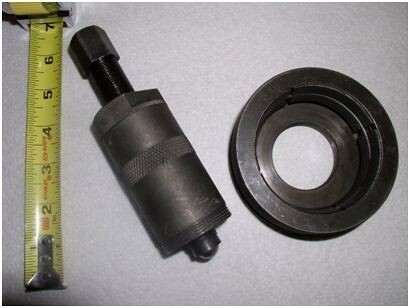 That theory is that the pre-load specification may be changed without changing backlash between the pinion head and ring gear, a critical setting for long life and quiet operation. This subject transmission is the perfect unit for this experiment, because my torque (pre-load) reading is at the very bottom of the acceptable range, and we’re going to try to get the pre-load spec further into the allowable range. Mental picture time; let’s say that the differential ring gear is adjusted to where it must be, for correct backlash (clearance), in relation to the head of the pinion shaft. 98% of 915 repairs will not require ring and pinion repairs, and I’m sure that most of the readers of this tutorial do not own the tools required to set pinion depth or ring gear backlash. 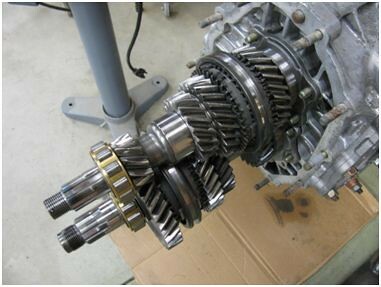 That said, we do not want to alter the relationship between the ring gear and pinion head. But we do want to increase the pre-load spec. The theory; we will remove the diff carrier bearing on the ring gear side and replace the existing shim with a thicker one (or, in this case, add a .25mm thin shim). Again, in theory, if the thickness of the shim on the speedo sensor side of the diff is not changed, the ring gear won’t move, and be placed closer to, or further away from, the pinion head (due to the strength and construction of the housing). 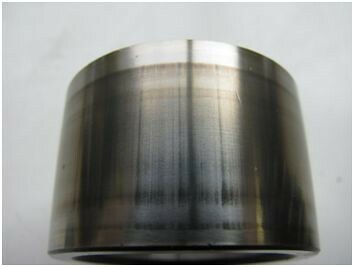 However, if the side cover bearing’s shim thickness is increased the only dimension that will change is the distance between the two carrier bearings, and any additional force will be exerted against the side cover. 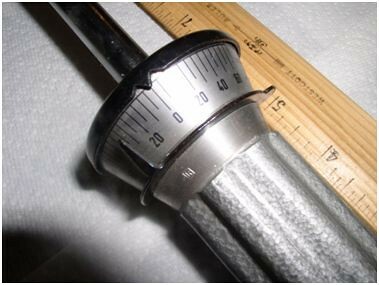 NOTE: Tutorial part 6 will cover the main shaft assembly, that repair has been completed at this writing, so what we’re going to do is assemble our subject far enough to allow us to measure backlash – prior to adding a shim to increase pre-load. To do this we must remove the diff side cover and set the assembly aside. 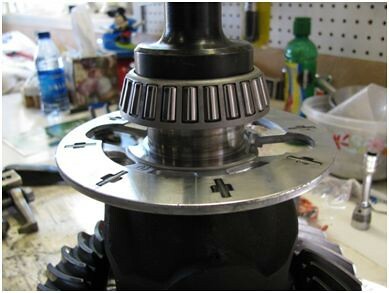 The next step is to place the pinion shaft and main shaft into the transmission, complete with the pinion depth shims. NOTE: Pinion depth shims are not usually damaged, but can be. They should be cleaned thoroughly, and examined/measured for wear. 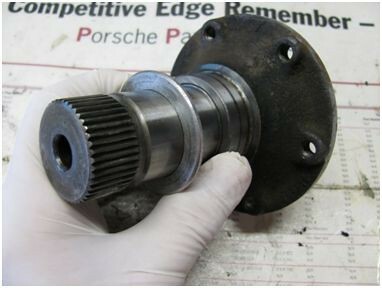 Wear seems to be directly proportional to how loose the pinion bearing race is, and how long the transmission has been in use since a repair should have been done. One of our shims (.20mm) is in good condition, but the thin .10mm shim is bad. NOTE: Pinion depth shims are available in .10mm, .15mm, and .20mm thicknesses. 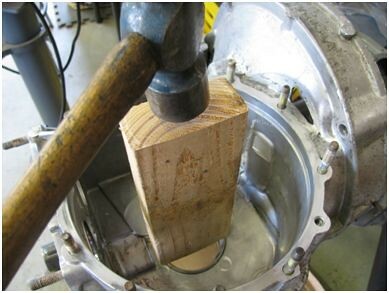 …and install and torque the old collared nut. The torque spec is 181 lb/ft. Lower the diff carrier into the housing, using an axle flange as before, and seat the speedo side bearing in its race. 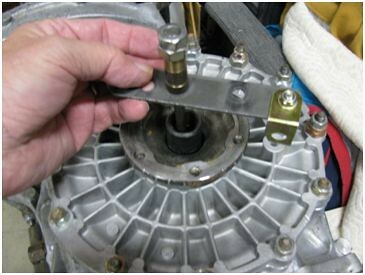 Remove the flange, install the cover with nuts but don’t tighten it yet, re-install the axle flange with your special washer and tighten the flange, drum roll please, using home-assembled tools. I have not had the opportunity to buy the factory tools, so I have gathered the following items to do the job. 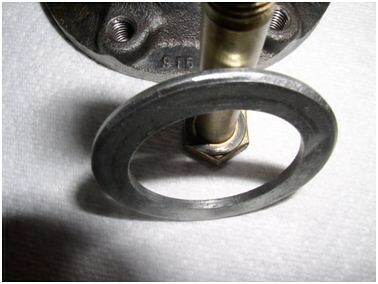 I hold/tighten the axle flange using a cast-off 911 cylinder head stud, check the following pictures, along with a socket (spacer), double nuts (to tighten), and an arm with marks at 76.5mm, which is the contact point for the dial indicator. The next step is to secure the pinion shaft from movement. More tools needed, and yet again I don’t own the factory tool (I do have the pinion shaft lock for 901/911 transmissions, but that won’t help us here). 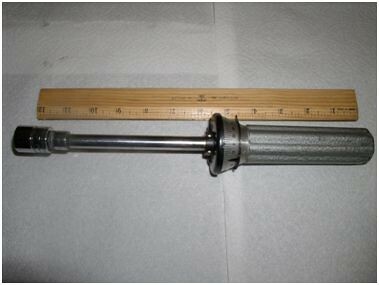 There have been many ways devised to hold the shaft, including jamming a large screwdriver between the gears! I think my method is a little cleaner, and you can probably copy it with a piece of metal bent appropriately. It’s been at least twenty years since I’ve seen the factory tool for sale, and I missed that one so I doubt that you’ll find one either. 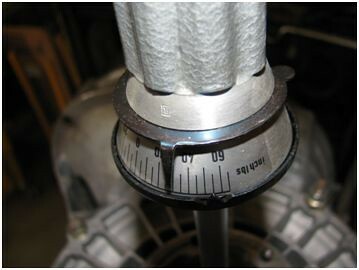 I install my pair of dial indicator holders, used for timing 911 camshafts, as pictured below, and the result is excellent (as the nut on the housing stud is tightened, pre-load against the 5th gear slider guide takes place, holding it tightly). 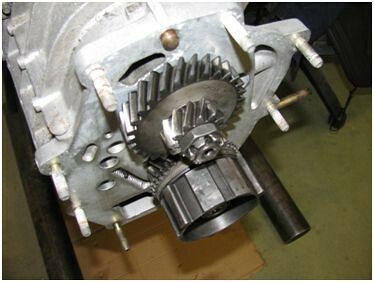 The movement in the pinion shaft is the clearance between the loose gears and fixed gears on the two shafts, and all of that movement must be eliminated. Now we can tighten the cover, a little at a time, working across the cover in a star-like pattern similar to the way wheel lug nuts are installed. During tightening watch the cover to be sure that it doesn’t get cocked to the side. 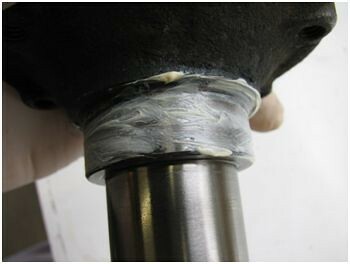 As the cover is tightened continue to turn the axle flange to be sure that binding between the pinion head and ring gear will not happen. 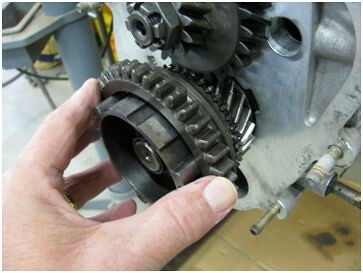 There must be clearance between the two gears at all times, which you can feel by moving the tight axle flange back and forth. That movement is the ring gear teeth meshing with, and moving inside of, the teeth on the fixed/locked pinion head. That movement, once the side cover nuts are tightened (17 lb/ft), is the backlash. 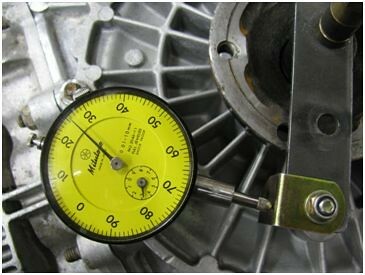 …so that its tip will contact the arm at the correct point, pre-load the gauge slightly, and re-tighten the axle flange after turning it so it will operate the dial indicator. Grip the axle flange firmly and move it back and forth. If you’re bad at math zero the indicator at one end/stop of the needle swing, and watch what the needle reads at the opposite stop. Remember, you’re dealing with diff carrier bearing pre-load in addition to trying to feel your backlash. This is a little tricky, so do it a number of times as practice. 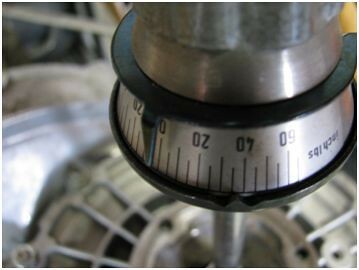 Move your dial indicator to a stud about 90 degrees from where it is, loosen the pinion shaft and turn it until it will operate the indicator at its new position (this is required by the factory to establish that the backlash is consistent). 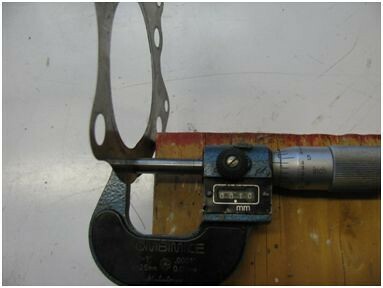 The allowed variation between readings at 90 degree spacing is .05mm, which is more than the norm. If you’ve had the ring gear off, replaced the carrier, etc., and trapped a piece of dirt on it during installation you might have a problem, but that would be unusual. OK, we have a backlash reading of just over .25mm. Let’s take the whole thing back apart, remove the side cover side bearing, add a .25mm shim (a lot), measure pre-load and re-check backlash. 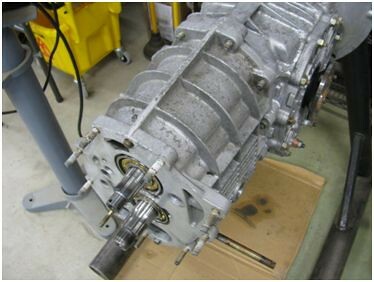 Of course, to do this we must remove 5th gear, the center housing, and the clamping plates so the main shaft and pinion shaft can be removed. NOTE: Aaaargh! During cleaning of 5th gear I discovered that it’s a throw-away! The dreaded chatter lines had not only affected the loose gear, the needle bearing bushing was wiped out as well. This, of course, means an additional expense of about $500, depending on how much a decent, used 5th gear can be bought for, in addition to a new bearing and bushing. This “chatter” line problem has been seen far more often than in the old days, unfortunately I don’t have an answer as to cause, but location inside the gear box, transmission fluid (oil) quality, and driver error (operation at road speeds to slow for 5th gear) are all possibilities. OK, off comes the side cover side bearing, and on goes a .25mm shim. After assembly and re-installation I measured the pre-load. Remember, FAG bearings require a pre-load spec in the 30-56 lb/in range; my new reading was just over 60 lb/in, before the axle flange snapped loose and came down into the mid-50s range! Even though pre-load was slightly out of spec, I installed the pinion shaft and measured backlash. KAZAAAM! The backlash had changed from just over .25mm all the way down to just under .10mm! 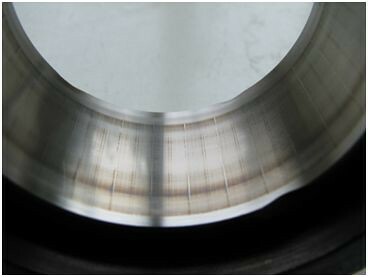 That means that increasing shim thickness at the side cover bearing does more than increase the pressure against the side cover, it also applies pressure against the ring gear, which actually pushes the ring gear closer to the pinion head. So much for the theory! Well, that experiment won’t fly, so apart comes our subject. I remove the ring gear/side cover side bearing again, but this time I measure the primary (thick) shim, which happens to be 3.1mm. Add .25mm to that and we were working with 3.35mm, which was obviously too much. I checked my inventory for a 3.2mm shim without luck. I did find a 3.0mm shim, and a 2.9mm shim. I reasoned that because my original carrier bearing pre-load was just barely in spec at 30 lb/in, and my backlash was only a small amount outside of the desired range, I opted to use the 2.9mm shim + (1) .25mm shim, a total of 3.15mm, a scant bit thicker than the original, single, 3.1mm shim. Back together she goes, and I discover a very favorable backlash reading of .19mm (down from .25mm). I took a short cut, and left the gear shafts in place, with the intent to read backlash before dealing with pre-load, which I’ll do after pulling the two shafts out of the transmission (I have to do this anyway). I was sure that pre-load would be nicely in spec based on the information that I already had, and that assumption was correct. Pre-load = 37 lb/in. So, what have we learned? 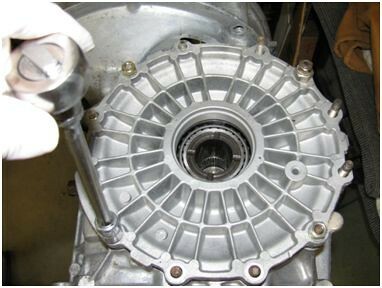 I think that the most important aspect of this experiment is that if the thickness of the side cover side bearing is increased, pressure is applied in both directions, and pre-load and backlash are both affected, Therefore, if the differential carrier bearings are replaced, both pre-load and backlash settings become necessary adjustments. Guess what? Let’s put the differential together! Remove the side cover, final clean it with lacquer thinner, and lubricate its o-ring. Some sources suggest using oil, I prefer white lithium grease. …and I use a bearing race driver and hammer to install it. Go slow with this, and when you strike the seal be aware that you can damage it. A light touch is a good thing. Also, the side cover seal is installed in a somewhat recessed position, but the opposite seal, in the housing, is installed flush with the housing. …insert the flange through the cover and into the carrier, and snug down its bolt. Torque the side cover nuts to 17 lb/ft, while turning the axle flange, and install two 8mm bolts into the axle flange. 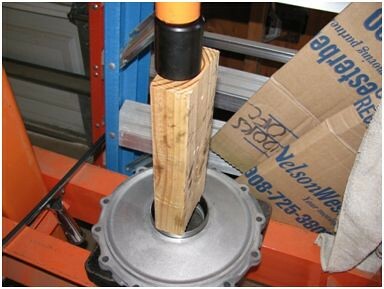 Use a screwdriver to hold the flange, and torque the axle flange bolt to 32 lb/ft. NOTE: Axle flange bolts changed during 915 production, always verify the type used on your differential, and look up the torque spec for them. Repeat axle flange installation on the housing side, stand back and look at what we’ve accomplished! It’s been a long journey, but significant progress has been made. See you in Tutorial Part 6!